I was away from blogging for a week now, but it sure does feel like a long time. Friends visit and an unexpected jaunt are to be blamed at. I did miss participating in few events, but I hope to make up for it with regular posts hereafter. I have never laid hands on chestnuts so far. But I have longingly looked at Indira devouring them year after year. This year I was lucky to find them at Whole Foods. They were $8 a pound. Ah, what the heck. All in the name of blogging. I roasted them like I did jackfruit seeds. But you will have to mark an ‘x’ at the top of the nut, helping steam to escape while roasting. Slowly roast ‘em on a cast iron pan, until the outer layer is dark brown in colour. The shell gently opens like a flower, as they heat through. Let it cool down a bit and enjoy ‘em while they are still warm. I was pleasantly surprised that they tasted more like jackfruit seeds, but moist and subtly sweet. The flesh was smooth and soft. 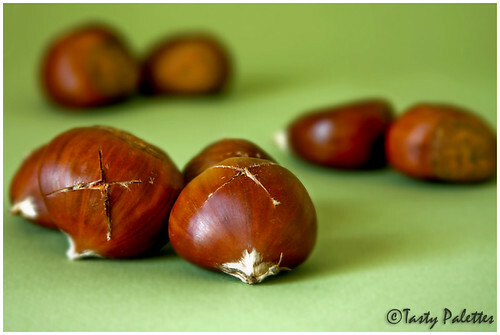 I hope to find more of ‘em throughout this winter and I would be glad to find out any recipes using chestnuts. I should thank Indira for alluring me toward these humble, yet delicious nuts, which, otherwise, would not have drawn my attention with their unassuming looks. I hope you would pay a second look next time you find ‘em at your grocery store or when a roadside vendor is roasting ‘em on an open fire. great way to come back to blogging with a simple and alluring post :) pics are lovely, as usual. I am going to try them, here we get lots of chesnuts, but have never bought them as i don't know what to do with them. Suganya!! I did taste once at my friend's place and but attempted to roast them at home though!! Those pictures looks so perfect and yummy!!!! Looks beautiful. Got to taste it soon. never had chestnuts..tho i always felt kind of drawn to them..
Me too, Roopa. I fell in love with 'em. Kaykat, Do post yr pic. I would learn what you did with your chestnuts. Even in a gray winter, there are a few things to look forward to, Sia. Thank God that didn't happen to me, Sunita. Indira had written a detailed post. Do try, HC. There are supposed to be few tasty recipes with 'em too. 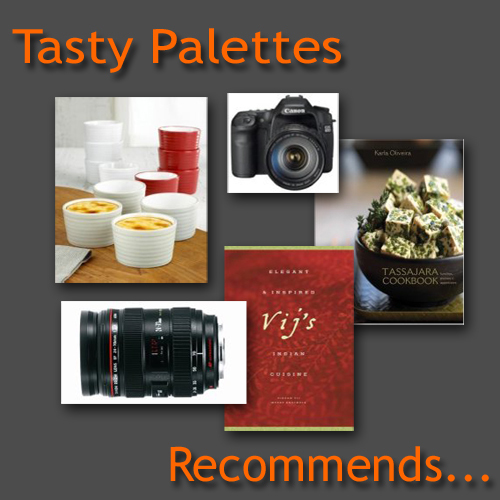 They go well with tea, Padmaja. They are not difficult to prepare too. Way early, Asha ;). How was your Thanksgiving weekend? You will find 'em somewhere, Kribha. Gotta keep your eyes open. Pardon my ignorance. What is enid-b, Rajitha? 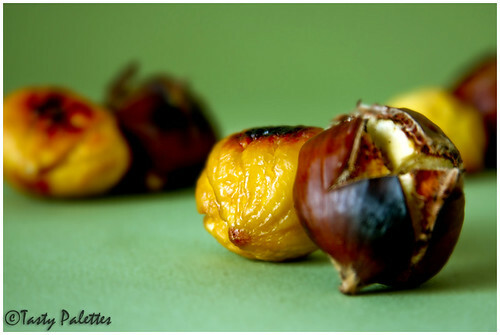 Totally love chestnuts! Your pictures are making me crave some! I LOOOOVE roasted chestnuts. When we went to China, we saw so many street vendors roasting chestnuts on the street in a big wok over hot coal. they're delcious mixed with jaggery and stuffed in kozhukattai. you can even make poli with the paste. Love the second pic Suganya! Roasted Chestnuts... yummy!! Well there are no road side venders where I live, but I will give them a second look next time I see them at the grocery store. What a fun thing to try this time of year! I just got some more, Musical. I was tempted myself. Jaden, I inferred that is a common fare in Eastern Asia from Rasa Malaysia. Bee, those are wonderful ideas. I will definitely try something in those lines. Thanks :). There are no road side vendors where I live too, Megan. But keep looking for 'em at yr grocery store.